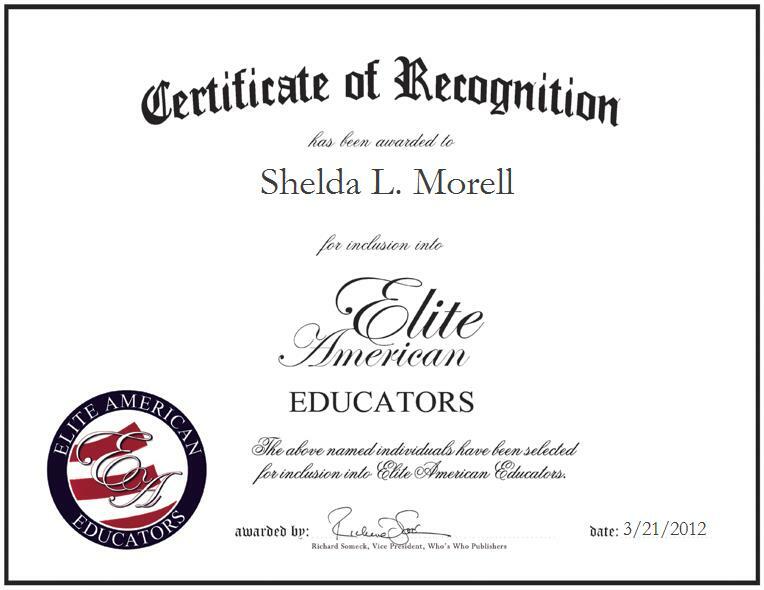 CARO, MI, March 21, 2012, Shelda L. Morell, Teacher for the Tuscola Intermediate School District, has been recognized by Elite American Educators for dedication, achievements, and leadership in special education. Ever diligent in her efforts to help children to accomplish their academic goals and achieve their full potential in school, Ms. Morell strives for excellence in her endeavors as a teacher by supporting the unique needs of the students with whom she works. She unpacks their backpacks, serves breakfast, and conducts the morning circle; she is also responsible for coordinating reading blocks and song sessions, reading books with students and reviewing the components of the stories, and overseeing gymnasium, music and pool activities. Because she is passionate about giving students the opportunity to learn and grow, she encourages them to write in journals, reinforces positive feedback from the day’s activities, and prepares daily lessons to fit individual needs. Ms. Morell has refined a skill set in the area of special education over the course of an illustrious career. She currently holds a Masters in Special Education with endorsements in Emotional Impairment, Cognitive Impairment and a ZA endorsement (Early Childhood Endorsement). She became involved in her profession because of her educational background and passion to help children through special education, and she attributes her success to sheer hard work. Some of Ms. Morell’s favorite pastimes include playing softball, gardening, and spending time with her family.